My plan is to get the e-book out as soon as possible after the last Eleventh Doctor episode is broadcast on Christmas day — hopefully by the end of this year — with a physical version following as soon as I can get it done. As you can see, there’s a lot of brand new material here — I hope it will make the book worthwhile even to those of you who’ve read all the Doctor Who posts here. As I write this, everything is done except the last four reviews of Series 7, two more reviews of the episodes yet to be broadcast (The Day of the Doctor and the 2013 Christmas special), the Matt Smith summary/analysis and the Peter Capaldi thoughts. So I’m confident I can hit my end-of-year publication target date. I welcome thoughts on what level I should price this at (both the e-book and the paperback — and indeed the hardback if anyone’s interested in one). Also: is there anything else I should add to the book that I’ve missed? This entry was posted in Art, Books, Doctor Who, Series 5, Series 6, Series 7, TV. Bookmark the permalink. ii) harvesting our commentary for material! Should almost split off a second posting for discussing the ebook pricing; its an interesting and ugly topic. Indie stuff is a tough sell (heck, pro writers have it hard! ); and you’ve got a timing hit here.. you want to land right with this whole 50th anniversary excitement, and may well peter out soon after. But in general I think ebooks are priced too high; the ‘app market’ mentality has been dragging peoples expectation of pricing down, but I’m okay with paying for something; the right sweet spot; not $10 per ebook, a couple of bucks is okay though. On pricing: What’s clear is that the ebook needs to be between $2.99 and $9.99. In that range, Amazon pays 70% royalties, but outside that range it’s only 35%. But that still leaves a big range to pick from. By all accounts, Amazon achieves about 80-90% of all ebook sales, so that’s the platform I will be targeting (though I don’t rule out other formats later if there’s demand). The printed copy will likely be done at Lulu (unless someone can recommend a better alternative). The base-prices of their actual books are pretty good value, but they do tend to sting you on P&P. wyrdwyrd, WordPress sites use HTML. I have no data or reasoning to go on for ebook pricing; I’d assume lower sells more (but this is _not_ always the case; it is often the case where you raise the price to raise sales, odd as it may sound.) .. you’ll maybe want to vary pricing over time to see how it goes .. ie: if you lower it $x, and sales go up, your net profit is now higher or lower? you want to find that sweet spot of course. Do ebooks have any artificial details going into the entropy – the app store for iOS for example has an _enormous_ dominating impact on sales; if your new, you get brief exposure as ‘new app’; if youre a top app, you get universal visibility; but if you’re not new, not highlighted, not a top app, you’re basicly nobody and few will ever see you. So you cater to the _app store_ rules more than anything. Are there top-ebooks and such lists that matter, or can you just ride on the ‘doctor who’ in the title and see how it goes? Anyway as to pricing.. how many pages? few illustrations I’d imagine.. If its a short book, that will definately limit your pricing for the printed volume (more obvious there), and have some impact on the ebook version. I’m betting its no War and Peace, so assuming its short, and you want ‘impulse buy’ and want to hit hard up front to capitalize on the 50th (all assumptions on my part) .. aim for low; $2.99 then. Jeff, the actual writing is a big job. I couldn’t face the added, intrinsically uninteresting, work of contacting everyone who’s made an interesting comment and negotiating permission to use it. Sorry. I don’t know how e-books are promoted. My only plan is to get the word out among Doctor Who fans, rather than to reach non-fans who impulse-buy because it’s listed prominently somewhere. To be honest, impulse-buying non-fans might not enjoy it much, and I’d much rather concentrate my sales on people who will. When it’s out, I would really appreciate the help of the community here to get word out into wider Doctor Who fandom. Yes, the book is very short on illustrations, because again I can’t face pithering away my time negotiating rights. It took me quite a while to make the cover, because it had to be done entirely with images that either unencumbered by copyright or liberally licenced. Using similarly free source material, I have made introductory images for Series 5 (a crack in a wall) and Series 6 (an astronaut coming out of a lake). I have nothing as yet for Series 7, and am tempted to go with your suggestion of a sauropod — after all, there are dinosaurs in Series 7, albeit crappy theropods and ornithischians. I expect the book to be reasonably substantial, in fact. At present, the manuscript is 142 pages of A4 in 12-point times (66,000 words). I’d imagine there’s about another 10-15% to go on that, so call it 76,000 words when complete. There are typically about 350-400 words per page in a 6″ x 9″ trade paperback, so that would suggest a page-count of about 190-220 pages — probably closer to the latter, given the whitespace at the end of sections and so forth. OKay, so look up ebook pricing for similarly sized fair; maybe look up other public loved geeky stuff.. Firefly or something, to get a gauge. I really can’t hazard pricing guesses, and I definately hope you can fiddle with pricing over time.. but I’d still go low. But not too low, you don’t want to ‘cheapen’ the work; if peopel see $1.50 theyu’ll think ‘this is crap’ and move on; so where is inexpensive, fan right pricing, that expresses quality.. Still, y gutt feeling.. don’t go high; $4.99, $5.99 max? I dunno. Re: pricing… I’ve found that $4-$5 is the optimum price point for my ebooks. Much more than that, and sales drop off. Much less and the extra sales don’t make up for lost revenue. I suspect your audience will be much the same as mine, and so I’d say that would be optimal. For the paperback, the important thing to realise is that most of your sales won’t be through Lulu itself, but through Amazon. I go for a round number that gets me just into profit from Amazon sales but a decent amount of money through Lulu. In my case that’s £10, which makes a quid or so from an Amazon sale, but much more when sold through Lulu. Make sure you put your book up on Smashwords as well — Amazon actually accounts for more like 60-70% of ebook sales, and Smashwords will get your book on *all* the other platforms — including library loans, the iBookstore, Kobo, and so on. Smashwords’ style guide can also be used to format your manuscript for the Kindle edition, so it doesn’t require much more effort. I’ve got a couple of grand sat in my Smashwords account waiting for me to sort my taxes out, so it’s worth doing. Hardback — these don’t sell, partly because unlike paperbacks they don’t get sold through Amazon. I don’t think I’ve sold more than half a dozen copies of any of my hardbacks. But on the other hand, it only takes about three extra clicks to add a hardback version on Lulu, so you might as well make those extra half-dozen sales. Price it however you like, and see what happens. First, give your book plenty of googlejuice by going through all the blog posts you include in it and adding “this essay is included in my book, which can be found here”. Most of my Lulu sales, and a substantial fraction of the Amazon ones, come from me doing that. Thanks, Andrew, that’s all helpful. You pricing experience is a helpful corroboration to my intuition, which is that about £3-4 is right for an e-book. Smashwords IS on my list, but their ultra-controlling formatting instructions are more than a little offputting and I’m not thinking about that till I have the Kindle version out there. I didn’t realise Amazon sold Lulu books: that’s going to be helpful. On your first piece of advice: thanks, I probably wouldn’t have thought of that. On the second: I don’t think I have the time to be a serial author: most of my writing effort goes into academic palaeontology, open-access advocacy and of course blogging. I might do one or two more compilations, but I don’t see my self ever reaching double figures. BTW., I’m very aware that my Doctor Who book will be coming out at about the same time as both yours and Andrew Rilstone’s. I did worry that this might split the vote, but hopefully instead we’ll have some good synergy, and poeple who’ve enjoyed one of the books will go on to get the others as well. I suspect that following the Smashwords Style Guide is actually pretty good advice for your Kindle books as well — self-published ebooks are notorious for formatting problems, and the style guide pretty much ensures you’ll avoid them on any platform. And yeah, I don’t think it’ll be competition (although I’ll note that mine will be out first, so if it is, I’ll win ;) ). We’re all doing slightly different things, and I strongly suspect Rilstone has already made the vast majority of what he’ll make from the book upfront. No, that doesn’t help — rather the opposite. Self-published authors endorse each others’ work so often that Amazon has banned them from reviewing books on their site, and it’s often a sign of really bad-quality work. I mostly don’t know about ebooks. Mostly. But I do know a little bit about online scams, and it’s gratifying and not surprising to me that Amazon has banned authors from reviewing each other. Ever since “Internet Marketing” became a thing there has been a seamy underbelly of influential scamy-type-folks cross-promoting (and even engaging in flat-out price fixing) each other, and conning not-so-influential people into doing more of the same. Over and over, ad nauseum and beyond. Links sort of kind of available upon request. But the main site that I usually go to for this sort of thing has been stuck on read-only mode for a couple weeks now, more’s the pity. More recently, these same folks have, of course, gotten directly into the ebook biz. Except that what I actually mean is–they’ve gotten into the biz of tricking people into paying them a lot of money to be “taught” how to “make lots of money” selling ebooks. And, as is always said on the anti-scam website(s), I’ve seen more substantive *useful* information on the topic at hand (making and selling ebooks) in just these few comments on this post than I’ve ever seen in the many, many scammy sales pages that exist out there. Err… Sorry – I’m confused. Why all this talk about pricing? Why not publish free of technical and financial barriers under a CC-BY licence? That surely is the best way to maximise the impact of your efforts. I didn’t really “discover” Doctor Who until Matt Smith’s incarnation. Looking for more information is how I found your blog. I have loved all of your reviews and enjoyed the discussions in the comments. I am very much looking forward to your book! I have purchased books through Lulu in the past. The postage can be a bit dear, but I do so enjoy a physical book so much more than digital. Thanks, Amber, that is hugely encouraging. You have single-handedly raised the number of expected sales from zero to one: a factor of infinity. Competition doesn’t arise. But maybe we ought to think about ways of promoting each other? And when our (me, thee and Andy H) Great Works are complete maybe we should think about collaboration? To paraphrase a great man: Kickstarter is kerr-razy. Collaboration and cross-promotion sounds like a good idea, although you seem *far* more popular than me — your Who Kickstarter raised ten times as much as my music one — so I don’t know how much I’d be able to help. But I’m definitely willing to discuss stuff.. I do think that the three books actually complement each other very nicely in giving different views of Doctor Who at fifty. Andrew H’s covers all fifty years; Andrew R’s covers the whole of New Who (which, and this is scary, now comes to nine years); and mine focusses exclusively on Matt Smith’s three series. So at the very least, we can justly tell our readers (both in the books themselves and on our blogs) that they can read the other books to zoom in or out. That thousands though is over three years on all the stores Smashwords sell to — Kobo, iBooks, Sony, Nook and so on. That’s an average of about one sale every three weeks for each book, averaged over the eight books. That pages needs just a bit of loving.. a consistent style application to the content, and an update to the theming that houses it all. Content is most important above all, but it has to be accessible; putting barb wire around even the most welcoming of used book shops. Yes, that’s Rilstone’s blog. I do agree it’s pretty ugly — and its commenting system is horrible, as on all Blogspot blogs — but the content is fascinating. One minute, pandering too my ego, people buy autographed hardbacks because they are such BIG FANS of ME ME ME, next minute, calling my dear darling blog UGLY. Hmm. I shall go away and sulk, or write 500 words about Curse of the Black Spot. Or something. Once Mr Book is finished, I promise to spend some time working on the look and feel of Mr Blog. Although I cannot help but note that the problem of the narrow strip of text and small type face can be solved with a couple of “CTL +”. lol ;) I’ve never read your blog, so no idea about the book; but I certainly will suss out any material upon it for due consideration! I liked your stuff about what it’s like to have been a fan since the time when, e.g., “Tomb of the Cybermen” was first broadcast, and how that experience can never really be recaptured. I mean everybody knows that, but it’s somehow totally different when you give us your first person perception of the experience of watching Tomb again after so long. Now I feel somewhat justified in my calling myself a true fan, but also not going back to try to watch the very, very long ago 1st and 2nd Doctor serials that maybe don’t work so well now as they did then. In order to really get the experience, I’d have to do a Doctor Who trick: I’d have to spawn a new consciousness for myself as a child in 1950s or 1960s Great Britain, then watch the show, then merge that experience back into 2013 me. There’s just no other way to capture the flavor. The first (and to an extent second) Doctors actually work rather better than anything that came after. They’re good television, and you don’t need to be a seven-year-old in 1963 to think so. For those just feeling their way in to the Rilstone oeuvre, I’d also like to recommend this piece, related only very tangentially to Doctor Who, which is perhaps my favourite thing I’ve ever read about Christmas. 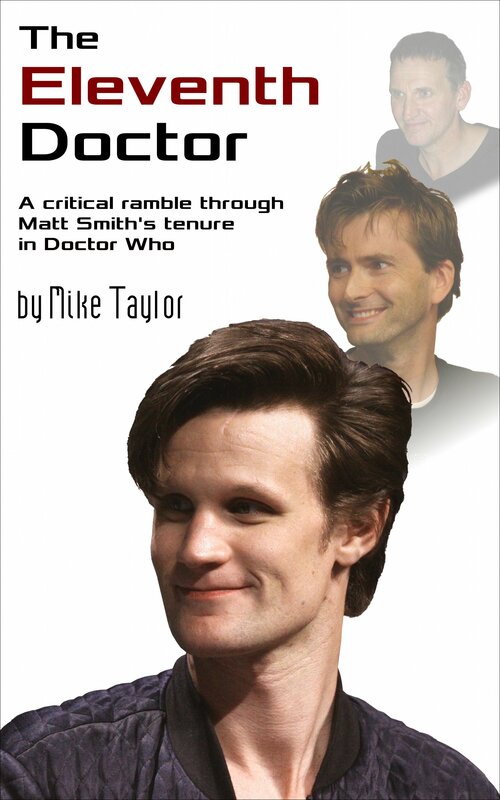 Suggestion for the book: review “Night of the Doctor” also! Because I make such an effort to remain spoiler-free, I avoid Internet chatter about Doctor Who. As a result, I’d never even heard of Night of the Doctor. So a big thank you for bringing it to my attention! I will indeed write about it in the book. Yeah, same here about trying to be spoiler free. Someone had a link to it on Facebook. I saw it that way. Apparently Paul did it on condition that he not have to wear the wig. Funny stuff. And I’ve listened to many of the Big Finish audios that have Paul in them. That was a pretty cool line of dialogue mentioning the eighth Doctor’s companions from the audio adventures–with one stroke a bunch of stuff got canonized. Yeah I like that little mini-adventure quite a lot. It won’t, of course, mean much or anything at all for folks that have only seen the new series. As evidenced by the several comments on my friend’s post–a lot of “? ?” and “I don’t understand what I just saw”. But it’s all good. Doctor Who fandom is bigger on the inside, doncha know. This is The Week Before, so I’m trying to swallow a lot of Who; given there is nearly 800 episodes, its hard to choose which to try and sneak in, in commemoration..
I’m thinking the Caves of Androzani, for one; and some Pertwee, and maybe Ark in Space or some of the Key to Time for Tom Baker… but no time, not enough time! I recall back in 2010 that you’d mentioned your boys watching Who with you; I think your youngest was 7 or 8 at the time; my oldest is 6 now and the change from 5 to 6 and through 6 is enormous.. her scale of thinking growing so fast. The old question is of course.. when are they old enough for Star Wars, Harry Potter, Indiana Jones, Back to the Future etc.. and Doctor Who. 5 was too young; 6 she’s a little less feaful hiding-behind-the-couchy, and starting to read a little; maybe 7 is the time! She’s starting to get with Star Wars etc, its a little scary, but she’s coming into things.